Please allow me to introduce myself, I am the new chairperson of the Flint Hills Human Rights Project (FHHRP). I've been around for a long, long time, though. I am the longest-serving member of the FHHRP Executive Board, and the only person from the original FHHRP Executive Board still serving. The FHHRP was first organized in 2005-2006 with our original chair, Christopher Renner, in order to fight against the anti-gay marriage amendment then being proposed for the state constitution of Kansas. That amendment passed in April of 2006, although it and all other such laws and amendments would later be ruled unconstitutional.Just as all laws and amendments against interracial marriage were ruled unconstitutional before them. In Kansas, Douglas County had the highest NO vote against the amendment (where it was defeated). Riley County had the second-highest NO vote against the amendment, where it came within 300 votes of going down to defeat. The FHHRP later campaigned for the addition of the LGBT community to the city human rights ordinance of Manhattan, Kansas. It took a total of three attempts under FHHRP chairs Christopher Renner, Jonathan Mertz and finally by FFHRP chairs Mike Herman, Ted Morgan and Katie Jordan, but that effort succeeded in 2016. The first attempt was approved by the city Human Rights and Services Board but did not pass the city commission. The second attempt was approved by the city commission, only to be voted down by the next city commission before it could take effect. It was the third attempt that was a success, and housing and services protections for the LGBT community in the city of Manhattan took effect in 2017. Needless to say, the struggle for human rights including LGBT rights is not over in our community, in our country and in the world. I urge you all to participate in future activities sponsored by the FHHRP. Also, our Executive Board business meetings are open to all members and you are welcome to attend. The thought of going to therapy can be daunting. Some people think that you only go to therapy when you are going through a huge crisis. There can be feelings of shame and stigma surrounding the idea of going to therapy. The purpose of this article is calm some of your jitters by walking you through what an initial therapy session is like. Going to therapy is an act of showing yourself compassion. It’s a desire to be a healthier person and a desire to change for the better. Usually people don’t scoff when you go to the dentist or a medical doctor or a massage therapist. Our mental health and relationships need care too and there is no shame in helping yourself in all aspects of your life. The initial session is generally called an intake. The purpose of the first session is for you to find out if the therapist is a good fit for you and for the therapist to better understand your needs and goals for therapy. Before the first session you can call the clinic and request a free phone consultation with the therapist. On the phone or during your first session you can ask your therapist how long of a time commitment you should expect. Marla B. Cohen, a therapist interviewed on goodtherapy.org points out that “You should feel safe, accepted, respected, and relatively comfortable. Not all therapists are right for every person, so use your first session to assess whether or not the therapist you chose feels like a good match for your personality.” Therapy is a unique relationship in which you will be discussing very personal topics. Find someone that you feel is informed about the topics you want to discuss and with whom you feel you can be open. Sometimes you switch medical doctors and it’s also okay if you want or need to switch therapists. This is normal and you have every right to do so. It’s your money and your time so think of it as an investment in yourself. Find someone who jives with you. You can tell your current therapist and they will understand. Or you can reschedule with the secretary and ask for another therapist in the same office. Another option is to search for a different therapist in a different practice or clinic. The K-State Family Center offers counseling for students and community members. It is located on campus at Campus Creek Complex. The fee is determined by a sliding fee scale based on income and number of household members. For more information, you can contact The Family Center at this number: 785.532.6984. Another option is Pawnee Mental Health Services on 2001 Claflin Road. They also provide services in Wamego and Junction City. If you do not have health insurance, the fee is based on a sliding fee scale dependent on your level of income. If you are insured, the insurance company will be billed and you will be responsible for the co-pay. You can call your insurance company to determine how much your co-pay is with insurance. If you are on Medicaid then it’s free. They also have a sliding scale fee for non-insured. You can contact Pawnee Mental Health Services with any questions at this number: 785.587.4300. Sarah Bridges is a board member of FHHRP and is an ally of LGBTQIA+ folks. Sarah has a degree in Health Science with an emphasis in Public Health. She is originally from Arizona but calls Manhattan, Kansas her home. In addition to her volunteer work, Sarah is an online ESL teacher. In her spare time, she enjoys hosting book clubs with her husband, hiking, yoga or painting with her strong little girl. The Holidays can be a rough time of the year. For some queer folks, going home for Holidays is sometimes not even an option. In a Bustle article, Marissa Higgins empathizes with queer folks by pointing out how “It's also useful to remember that while some LGBTQ[+] people are not explicitly estranged from family, they may choose to avoid or limit family interactions for their mental or physical health. This, too, is valid! What's more, coming out to family is a complicated process for many people, and just because someone is out in their daily life, or to their friends, does not mean they feel safe coming out to family.” With this in mind, let’s explore four practical self-care ideas for queer people of all ages. Setting boundaries are about taking personal responsibility to state what you like, dislike and it’s also advocating for your emotional and physical safety. It also allows you to belong to your self and your values and opinions while respecting others who may think differently than you. Hanks helps individuals detect when boundaries are weak by encouraging people to reflect on when they have feelings of resentment. For instance, when we start resenting someone it oftentimes stems from a lack on our part to say “no.” In other words, it means our boundaries have been breached and we need to be more clear to others. For additional help with setting healthy boundaries, click here. Finding someone to hang out with is a great way to cope during the Holidays. Plan a “Friendsgiving” or see what is going on locally. Being around people who allow you to be yourself is very rejuvenating and important. Apps such as Bumble or Marco Polo are great for finding friends and connecting to people too. 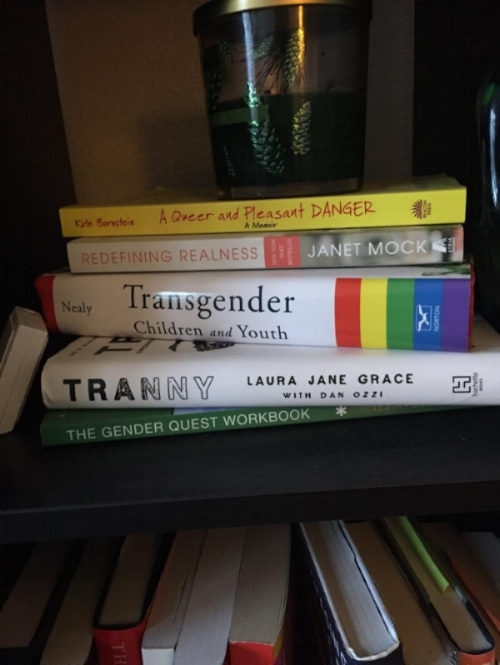 Reading queer memoir’s can be affirming, educational and relaxing for queer folks. Give yourself permission to spoil yourself this Holiday season by taking the day off, eating at your favorite restaurant, going on a trip just for you, going to a concert or enjoying a warm bubble bath. Treat yourself how you would treat your closest friend. Before we discuss SAFE Zone Allies, let’s define what an ally is and is not. According to the Human Rights Campaign (HRC), an ally is "a person who is a member of the dominant or majority group who works to end oppression in their personal and professional life through support of, and as an advocate for, the oppressed population." Allies use their privilege to promote positive change in their communities and have been successful in changing the dominant culture. Allies can help racial, religious and ethnic minorities as well. What is a SAFE Zone Ally? SAFE is an acronym for Students, Administrators and Faculty for Equality. Generally individuals in communities and campuses have a logo or sticker that indicates that they have been trained and are a safe person to talk to about LGBTQ+ issues and they are supportive of LGBTQ+ individuals. SAFE Zone Allies may have their logo or sticker on their door, laptop or in a different noticeable area so LGBTQ+ members will know they are safe to be around or discuss anything with them. Although workshops and training’s vary in their approaches, you can expect the training to include two parts: 1. Reflective questions and exercises to process and work through your own prejudice and internalized oppression. 2. Effective ways to respond to situations as an ally. Both straight and LGBTQ+ individuals or groups who are students or faculty at KSU can register here to be trained at KSU as a SAFE Zone Ally. On that link you will find details of a training on Monday, October 15, 2018. If you are not a KSU faculty member or student, there is a self-guided training online for anyone to use. Click here for more info. Avoid trying to convince members in the LGBTQIA+ community that you are on their side; just be there. A few months ago family and friends celebrated as their loved ones graduated from K-State. Each year among the graduation festivities lurks a sobering tradition hosted by the Westboro Baptist Church (WBC) in Topeka, Kansas. WBC is known for going on tour and picketing at places where they know LGBT+ people will be in a public setting. We at Flint Hills Human Rights Projects also have a tradition--although ours is not as sobering. We show up an hour early to graduations each year to take up most of WBC picketing spot. Our presence is a bit different--we have signs that say, "Congrats Graduates!" or "Love is Love" with a rainbow flag waving in the wind as we pass out donuts and orange juice to the graduates and their loved ones on their way to commencement. A Police Officer annually stands close by to protect everyone and then leaves as soon as the WBC protesters are gone. In Netflix Season 2 of Queer Eye addresses the conflict of when God or beliefs come between LGBT+ members and their families. Many parents don't know how they can accept God and their LGBT+ child at the same time. Although change is happening among families and communities, it can feel like it is happening at a very slow rate. If attending church in Manhattan, KS within an affirming and open congregation is your desire, please check out our resources. And if you haven't heard it already today, know that you are enough. Don’t let transphobia/cissexism slide. Confront it as you would confront all other forms of oppression. Trans issues are rarely discussed & when they are it is often in a negative light. Click on this link to learn some more ally tips. Activism comes in all shapes and sizes. No matter what our backgrounds or temperaments are, we all have something to contribute to our communities in smallish or large ways. Activism can be a petrifying task, but once a cause enters into our heart it's hard to ignore it. Remember, not all activists are the same. We can all do activism in our own way--the important thing to keep in mind is that we do something. This month I wanted to take an opportunity to spotlight one of our board members, Eric Roberts. Eric is presently one of the Co-Chairs of FHHRP. Eric was gracious enough to share with me a little about him and his activist efforts. "I grew up in East Tennessee on a tobacco farm in the Appalachian Mountains 45 minutes from the best place on Earth, Dolly Parton's Dollywood. I love spending time outdoors more about our world. I have a community garden plot here where I grow a variety of vegetables, herbs, and flowers to share with friends. Cooking is also a huge passion of mine. I love to try new recipes and foods. Nothing beats fresh veggies from the garden. My partner, Kent and I moved to Manhattan in 2015 as he is a graduate student getting his PhD in Ecology from K-State. I'm also very passionate about providing people the tools and support to live their best life. I will also never turn down an opportunity to meet and hang out with anyone. I love meeting new people. I believe that each person has such a great story and I love hearing about them." What advice do you have for loved ones of the LGBTQ+ community? "Recognize that no one understands our experiences better than we [members of the queer community] do." Activism is daunting for most people. Why did you decide to become involved with Flint Hills Human Rights Projects? What motivated you to be involved? Was there anything holding you back? If so what gave you the extra ounce of courage? "When we first moved here we had a bit of a bumpy welcome to Manhattan when a landlord tiptoed around the subject of renting to a gay couple and how it wasn't something they were comfortable with. It definitely put some apprehension into our minds about where we had moved. Then we found out about the work that was going on for the Non-Discrimination ordinance that FHHRP was spearheading. We immediately became members and started attending City Commission meetings in support of the ordinance. I think what finally gave me the courage to want to become further involved was just recognizing there was a need for this organization in this community, and no matter what we end up accomplishing it will matter to someone, somewhere." What advice do you have for people in the LGBTQ+ community who desire to be involved but aren't sure how? "The best way to become involved if you aren't sure how is to follow what's happening with an organization you'd like to be involved with, and show up to their events and talk to people. This was TERRIFYING for me at first, but it definitely helped with meeting people and growing my network of contacts in Manhattan." For ideas on how to get involved click on this link. We're all in this together. Whether our personalities are fierce or gentle, we have much to offer. Feel free to follow us on Facebook to learn of current news and event in Manhattan, Kansas. Believe that issues related to oppression are everyone’s concern, not just the concern of those who are the targets of oppression.